FUJI TV aired live “Johnnys Countdown 2018 – 2019” held last night at the Tokyo Dome, hosted by TOKIO’s Kokubun Taichi and V6’s Inohara Yoshihiko. The groups perform the usual group shuffle medley and member shuffle medley. Kanjani8 performed a 15th anniversary special medley, the whole of Arashi made it to the Dome for their 20th anniversary special medley, NEWS performed via live relay at Kyocera Dome and King & Prince debuted at the Countdown. A highlight is the final stage of Tackey & Tsubasa, who performed a special medley before being given a final send off by everyone. 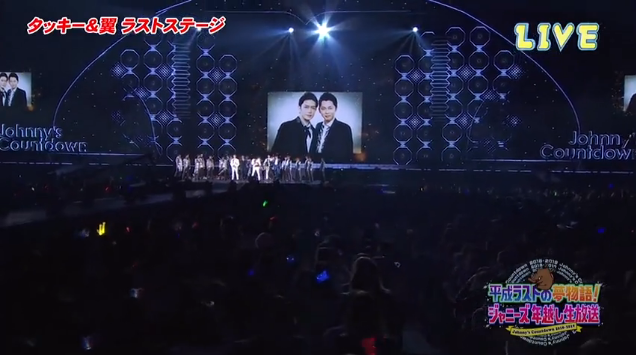 4TOPS (Yamashita Tomohisa, Ikuta Toma, Kazama Shunsuke and Hasegawa Jun) reunited to backdance for the duo.